Working alongside Hazel Parsons, we organised an event at St. Ives Harbour Hotel & Spa which allowed wedding creatives to meet, share knowledge, and build connections. We also had some great keynote speakers who left us all feeling very inspired. 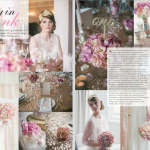 The event was covered by Ultimate Wedding magazine, and you can read the full article HERE.